Tarallucci not only are made with red wine, but pair prfectly with it too. Italians pull them out after dinner to nibble on with the meal’s left-over red wine wine. Made with olive oil and not too sweet, these cookies are a guiltless pleasure. 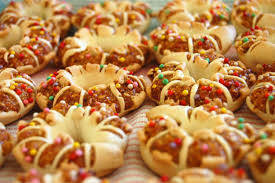 Tarallucci are ring-shaped cookies that symbolize a hug and signify friendship and affection in Italy. In the past, when legal contracts were made--such as for the sale of land—villagers didn’t employ lawyers. Instead they’d simply shake hands and embrace. To celebrate the deal they’d offer a toast of red wine and tarallucci. Seven dozen cookies may sound like a lot, and you can halve the recipe if you like. But you won’t regret making them all. For one thing, they are a snap to make and will stay fresh for months. For another, when you serve them to guests, they’ll beg to take some home. Tarallucci al vino are a wonderful holiday or hostess gift for the wine lovers in your life. In a bowl, combine 7 cups of the flour, wine, sugar, olive oil, eggs, and salt with your fingers or a wooden spoon until combined. Add more flour, a little at a time, until firm dough forms. Spread a sheet of parchment paper onto a work surface and roll a large handful of dough into a long strip, about 1/2 inch wide. Cut off a 3-inch section and form a ring, pinching the ends to seal it. Put a few tablespoons of sugar onto a small flat plate. Dip one side of each cookie into the sugar and put it, sugar side up, onto the baking sheet. Bake for about 15 minutes, until dry to the touch. 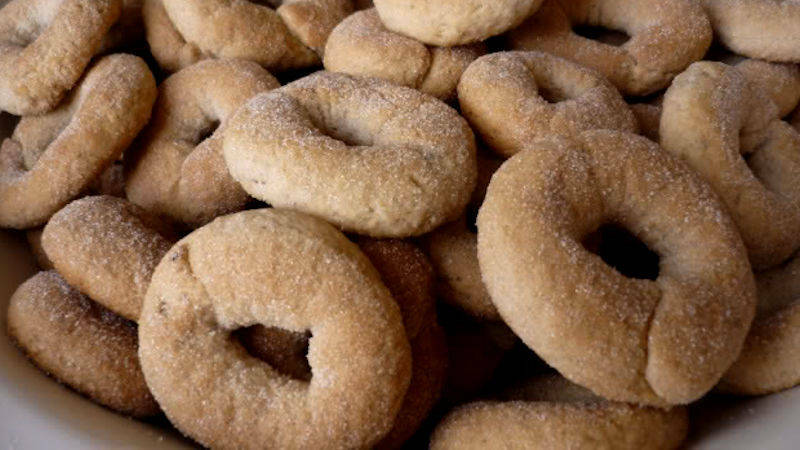 Once cool, you can store tarallucci, in a cool dry place in an air-tight container, for up to 3 months. 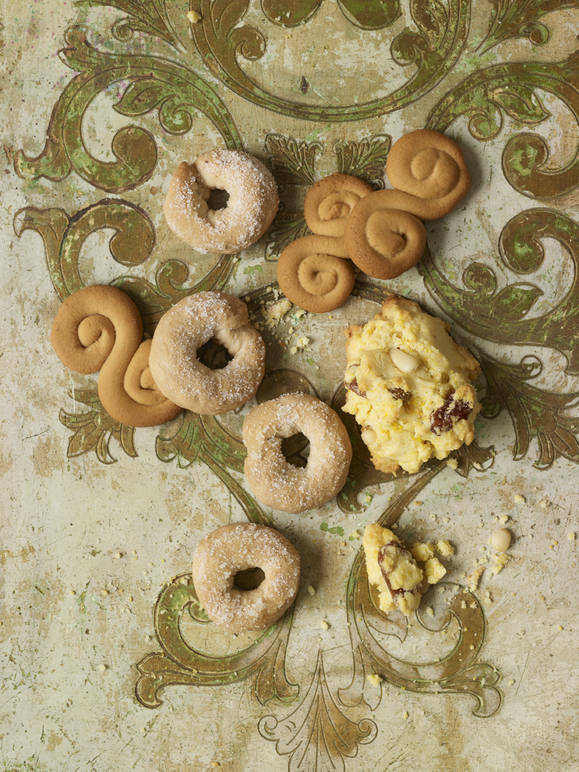 These honey cookies from Sicily that are made with just honey and flour. That’s it---just two ingredients. These absurdly addictive and amazingly chewy cookies epitomize the most fundamental Italian culinary rule that less is more! Italians believe that food should be prepared with just a few top-quality ingredients allowing each to be tasted and appreciated. Honey is the star here, so be sure to pick a high quality Italian honey. I particularly like carob honey, which is medium dark with a wine-like richness and aroma. Other good choices include buckwheat or prickly pear cactus honey. Put the flour, honey and a pinch of zest, if using, into a bowl, and with your fingers, mix until dough forms. The dough will be dense and sticky. The cookies can be made in almost any shape: round, long or as pictured here in an S-shape. Bake the cookies for 10 minutes until lightly golden and no longer sticky. Put the cookies on a rack to cool and dry. Then they can be stored in a sealed container in a cool, dry place, for several months. 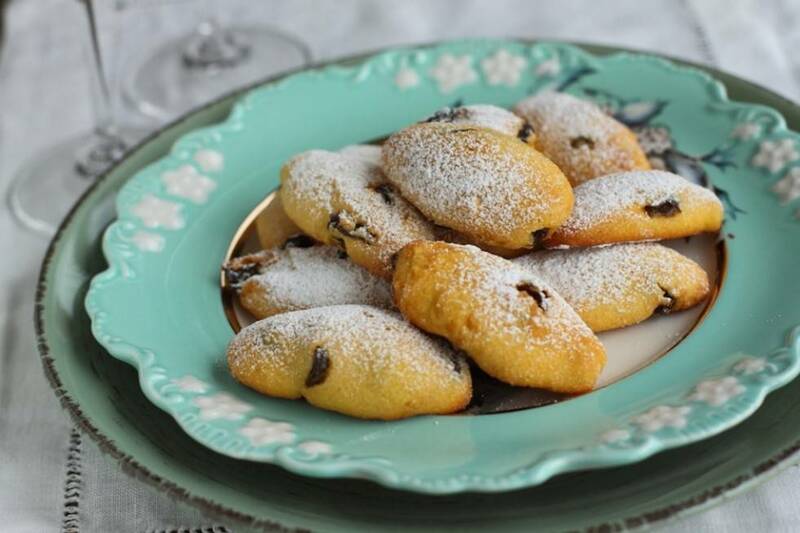 These moist cormeal cookies are a favorite in Venice, made with with raisins and pine nuts and a hint of grappa. They have a wonderfully rustic texture and amazing flavor. Preheat the oven to 375 degrees. Line 2 cookie sheets with parchment paper. In a standing mixer with whisk attachment, or in a bowl using an electric hand mixer, beat the butter and sugar until light yellow and fluffy. Beat in the yolks until well combined, then beat in the milk, baking powder, salt, zest, vanilla and grappa, if using. If you are using a standing mixer, remove the bowl and stir in the raisins and pine nuts with a wooden spoon. Slowly sift in the cornmeal and OO flour, incorporating with each addition, until batter forms. It will be very dense. Put heaping tablespoonfuls onto the prepared cookie sheet and bake, 12 to 14 minutes, until just lightly golden around the edges. Do not over bake.